The genus Daphnia has an intriguing reproductive mode of cyclical parthenogenesis. This reproductive mode has been studied for centuries, but cytogenetic information is lacking due to technical limitations of classical methods. 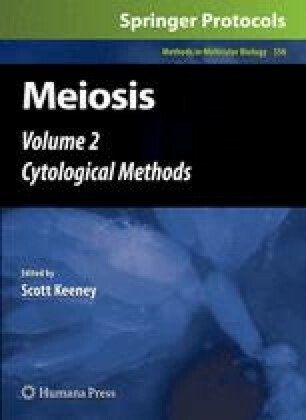 We have developed methods for the preparation and examination of meiotic chromosomes of Daphnia pulex from oocytes and spermatocytes. Oocyte chromosome preparations are obtained by isolating individual oocytes after the release of yolk granules from the ovary using pressure and capillary action. Spermatocyte chromosomes are prepared using a conventional squash method. Cryosectioning is an easy and fast way to prepare sections. We also illustrate the application of immunofluorescence staining against α tubulin, as well as fluorescence in situ hybridization (FISH) using the intergenic spacer of ribosomal DNA or single-copy cosmid clones. We would like to thank Armin Moczek and Teiya Kijimoto for their help with cryosectioning as well as helpful suggestions. This work was supported by National Science Foundation grant FIBR-0328516.